"A very easy yet really interesting way to prepare this fish. 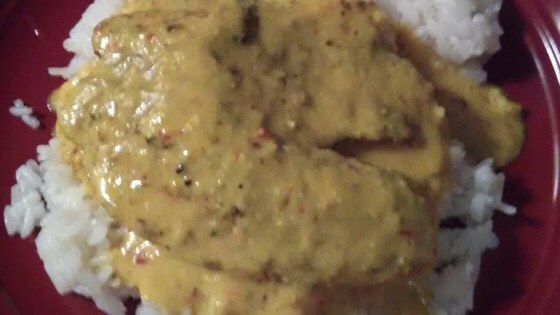 Tilapia fillets are simmered in a seasoned coconut milk sauce for a luxurious flavor. These will look beautiful served over a bed of rice. Adjust the amount of spice to your liking by adding more or less red pepper flakes." In a food processor or blender, combine the coconut milk, almonds, onion, ginger, turmeric, lemon grass, and 1/4 teaspoon of salt. Process until smooth. Heat a large non-stick skillet over medium-high heat. Season the fish fillets with salt and pepper on both sides, then place them skin-side up in the skillet. Pour the pureed sauce over the fish. Use a spatula to coat the fish evenly with the sauce. Sprinkle with red pepper flakes. Reduce heat to medium, cover, and simmer for about 15 minutes, until the puree is thickened and fish flakes easily with a fork. This is a very good recipe. I used garlic chili paste instead of crushed red pepper to give it an authentic Thai flavor. Would definitely recommend making this dish. We are huge thai fans and this was extremely disapointing.